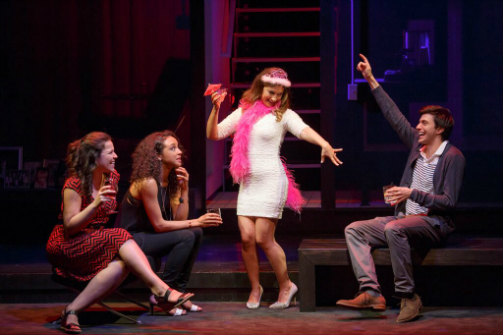 Lindsay Mendez, Carra Patterson, Sas Goldberg, and Gideon Glick in Significant Other. Photo by Joan Marcus. BOTTOM LINE: A tight ensemble and funny writing don’t quite make up for underdeveloped characters in this dramedy about a gay man still trying to find The One after his friends all get married. Jordan (Gideon Glick) is a 20-something, neurotic gay man who lives on the Upper West Side and works in advertising with Kiki (Sas Goldberg). His world revolves around his three girlfriends and when he’s not with them he’s checking in on his widowed grandmother Helene (Barbara Barrie) who has age-related memory problems. The girlfriends are single, but not for long as each, in quick succession, gets paired off. After Kiki decided to “stop thinking about other people and… just do me for a while” and not go in search of a boyfriend, she met Conrad (John Behlmann). As the play opens the friends are celebrating her engagement. She makes this declaration wearing a pink feather boa and tiara, which fits her outlandish personality perfectly. Playwright Joshua Harmon gives Kiki some of the funniest lines and Goldberg plays her over the top without going overboard. Dark and depressed Vanessa (Carra Patterson) hates weddings and thinks “being alive is so weird.” She meets Roger (Luke Smith) at Kiki’s wedding and soon they’re engaged, with another bachelorette fest and wedding. Jordan tells his grandmother about the new unions and that neither Kiki nor Vanessa asked him to be a bridesmaid, which he says he’s okay with but increasingly isn’t. It’s a riveting scene, but one that gets to the heart of the problem with the lead character. Jordan is funny, sweet, loyal and sympathetic and Glick is very winning, endearing and makes Jordan feel very genuine and human. His pain is understandable but only up to a point. Where are his other friends? Does he have any gay friends? Why is this guy barely past the quarter life mark so desperate for a boyfriend? We know little about what kind of boyfriend he would be -- other than eager and obsessive, which he amply displays as he unsuccessfully pursues two potentials: Will (Behlmann) and Gideon (Smith). That’s not the fault of Jordan or Glick. I needed Harmon to have given the audience a more fully realized character who undergoes some sort of growth or understanding about himself because he’s as deserving of a loving relationship as his friends. The girlfriends also didn’t ring entirely true for me. Who are these 20-something women in New York getting married and changing their names? I would maybe expect this in the Midwest where people do statistically get married younger than their East Coast counterparts. These issues aside, the young cast is uniformly great. Mendez is a stand out in the best written female part, warm and convincing as Laura. And Smith brings a tremendous amount of variety to the very distinct roles of straight Roger, flamboyant Evan from the office and sweet Gideon. Barrie, a grand dame of the stage in her 80s, is wonderful as the sad, funny, loving Helene: she brings pathos and tenderness to her scenes. Mark Wendland has created a brilliant, economical set where every room blends into each other without being boxy. Kaye Voyce offers lovely wedding dresses and particularly hilarious bridesmaid outfits for Kiki’s wedding. Director Trip Cullman lends a sure hand to the energetic cast, and the show, at over two hours, never drags. As it happened, I saw the play just hours after the Supreme Court’s decision on marriage equality was announced, which added an extra level of poignancy. At the end of the evening at curtain call, each member of the cast came out holding signs that read “Love Wins.” That’s a worthy sentiment, and one that made me want more for and from lovelorn Jordan.